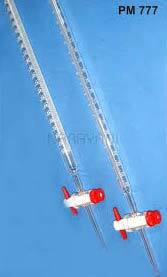 We are functional as Laboratory Burettes Manufacturer, Exporter and Supplier from Pondicherry, India. We cam make available almost all kinds of Laboratory Burettes that are used for dispensing measured as well as variable amounts of chemical solution. We choose the best grade materials to come up with the finest quality Laboratory Burettes for buyers all over the country and overseas. One can purchase Laboratory Burettes at relatively low prices from us. A traditional burette consists of glass tube of constant bore with a graduation scale etched on it and a stopcock at the bottom. The barrel of the stopcock may be made of glass or the plastic PTFE. Stopcocks with glass barrels need to be lubricated with vaseline or a specialized grease. Burettes are manufactured to specified tolerances, designated as class A or B and this also is etched on the glass.